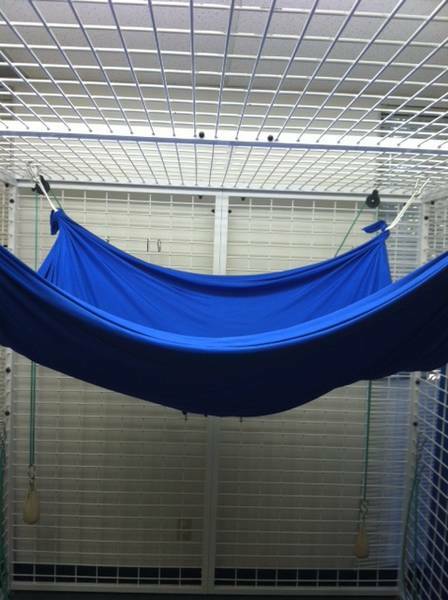 We have a lycra swing at our clinic and we love it! We are lucky enough to have a structure that we can hang our swing on so we can change the configuration depending on the needs of the kiddo. First we bought Lycra from a fabric store. I believe the dimensions were about 6 yards by 3 yards however you can make it as big or as small as you would like (you will be tying knots at the corners and it will take up some of the fabric). 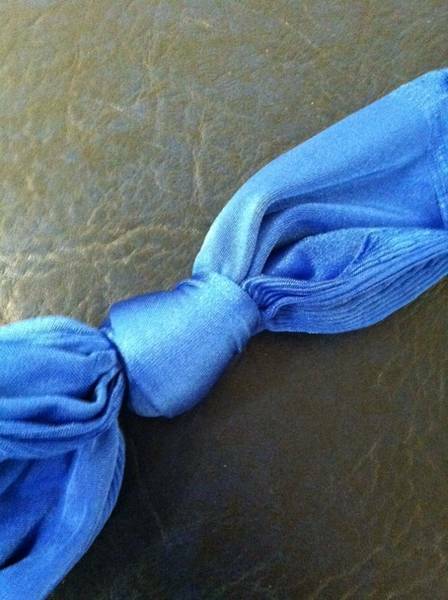 Make sure the fabric is large enough because you will be folding it in half. If you are going to be using it for larger kids you may want to triple it to provide more resistance to stretch. Second tie a knot at each corner. Now you will need to work with the rope. 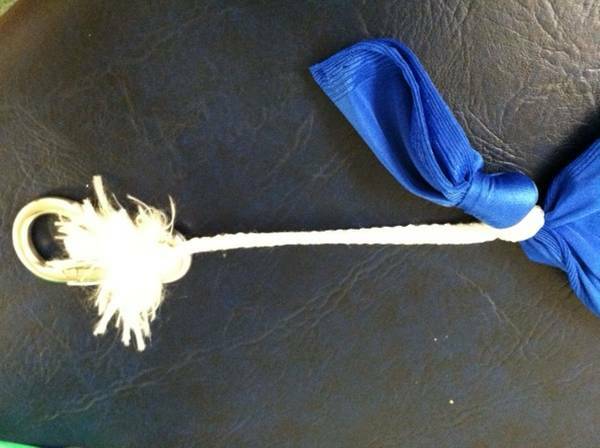 Cut 4 pieces of rope approximately 10 inches long and fold in half and tie an overhand knot in the ends to make a loop. Lastly you attach a carabiner to each rope and you are ready to hang the swing from a sturdy surface and have fun! 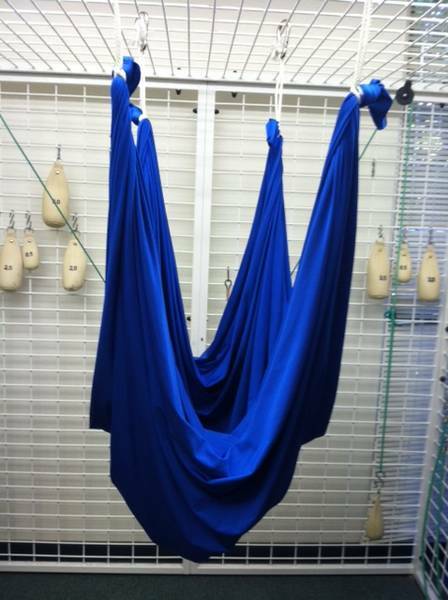 We will follow up with ideas for how and why to use a lycra swing in another post! This is great! Do you have suggestions for a secure surface parents can hang a swing from at home? Awesome! Will try – could suspend from swingset outdoors perhaps for at home use? Unfortunately I’m not sure of the answer. We generally work with kids 50-60 pounds in lycra. We have ours double folded but you could probably triple fold it to increase the support. Sorry I don’t have more of an answer. I’m 5’1″ / 125. You want 3 layers, 2 yd square, hang at 8 feet. Hello – I am another OT and would like to know where you purchased your lycra. Thank you! How many pounds can this swing handle? I’m not positive. We have used it will all of our kids safely because our hardware will support the weight. The limiting factor is the lycra and how small/tight you keep it to limit the amount of give. Hope this helps! If I were to buy this fabric only, what kind of mix would I need? 90% poly 10% lycra? 90% Nylon 10% lycra? or 80% Nylon and 20% lycra? We just bought lycra from the fabric store, I’m not sure of the exact mix. 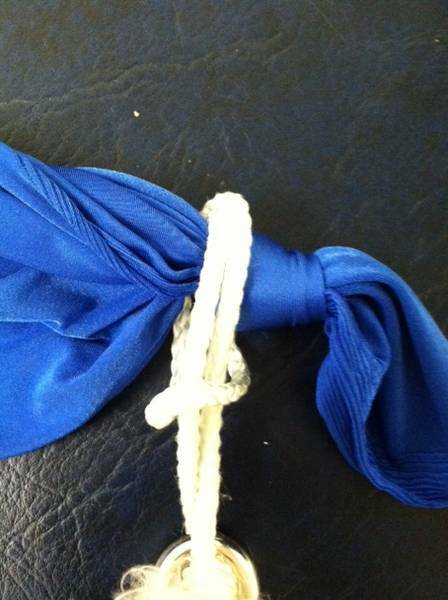 An overhand loop and overhand knot are not the same thing. I was stumped forever trying to figure out how you used the knot…I finally followed your link and you have it linked to the overhand loop. Where did you purchase your swing frame/structure? Also, did you use a 2 way stretch or a 4 way stretch nylon Lycra? If it is a 4 way stretch, did you use milliskin or moleskin? Which is more advisable for swing stability, longevity, strength, endurance, and “memory”? We just went to Joanne fabric and bought Lycra. Not sure what kind of stretch that was. Hope that helps! I could not find 3 yard wide lycra at Joann’s? only 5 feet with is just over a yard? any thoughts? thanks much! That should work as long as you can double it up. 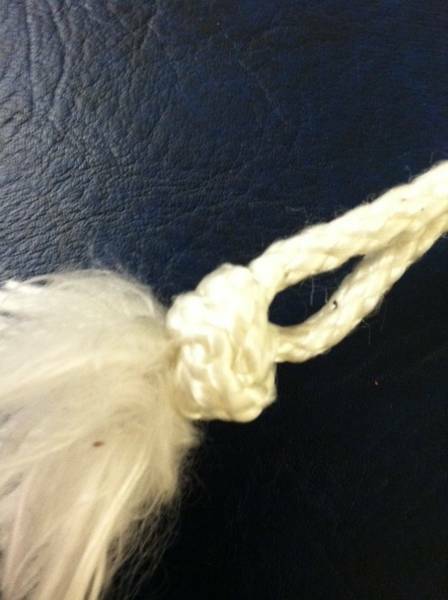 Any updates you can offer about the knots and how they held up?? We have never had a problem. do you know how many mm thick your rope is? The thicker the rope the harder it is to get a tight knot. Thanks!